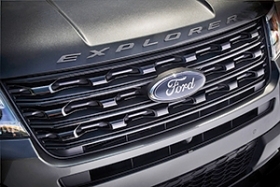 The sixth-generation Ford Explorer is scheduled to arrive at dealerships by early June. Editor's note: The Explorer has 33.3 inches of 3rd row legroom. An earlier chart with this story showed an incorrect figure. 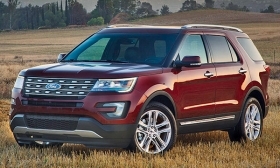 SAN DIEGO -- Ford Motor Co. already is struggling to meet demand for the Explorer, which has increased its share of the fast-growing crossover segment for four consecutive years. So the sixth-generation Explorer, scheduled to arrive at dealerships by early June, isn't designed to grow sales as much as it's aimed at bolstering the vehicle's profitability by attracting more affluent buyers. Zuehlk: Buyers like the styling. Enter the Explorer Platinum, with a luxurious interior -- quilted leather door panels, real wood trim and brushed-aluminum accents -- a high-end Sony audio system and a sticker price that put it firmly in luxury-brand territory. At $53,495 including shipping, the Platinum costs about 40 percent more than the inflation-adjusted price of the top-of-the-line Eddie Bauer series did 25 years ago, when the Explorer's debut as a 1991 model heralded the coming SUV boom. It's also $950 more than the Platinum version of the F-150 pickup. As America's most-popular crossover turns 25 years old, it gets a more powerful EcoBoost engine and a $53,495 Platinum trim to boost transaction prices. Strengths: Available 2.3-liter EcoBoost has best-in-class fuel economy and now is powerful enough to tow and support 4wd. Platinum trim is among the most luxurious vehicles Ford has ever built. Maintains more rugged look than most crossovers. Weaknesses: Pricier than many competitors, though it comes with more features as standard equipment. Doesn't get Sync 3 connectivity system until 2017 model year. Bottom line: Ford hasn't altered the outside of the Explorer in a big way, and why would it when the current one sells so well? But the changes it made should help the vehicle build on its four-year streak of market-share increases — if the factory can build enough of them. Wheelbase 112.8 in. 118.9 in. Length 198.3 in. 200.8 in. Width 78.9 in. 78.9 in. Height 71.0 in. 70.4 in. Curb weight 4,890 lbs. 4,850 lbs. 2nd row legroom 39.5 in. 36.8 in. 3rd row legroom 33.3 in. 33.2 in. Cargo volume 81.7 cubic ft. 116.1 cubic ft.
EPA mpg 16 city/22 hwy. 16 city/23 hwy. "We've never had this list of premium materials in a Ford before," said Michael Arbaugh, the Explorer's chief interior designer. The Explorer Platinum, which goes on sale a few months after the other four trims, is positioned to challenge premium editions of the GMC Acadia and Jeep Grand Cherokee. The Explorer Platinum tops those vehicles' starting prices -- $48,615 for the Acadia Denali and $49,790 for the Grand Cherokee Summit -- but includes four-wheel drive and other costly features that are optional on the competitors. 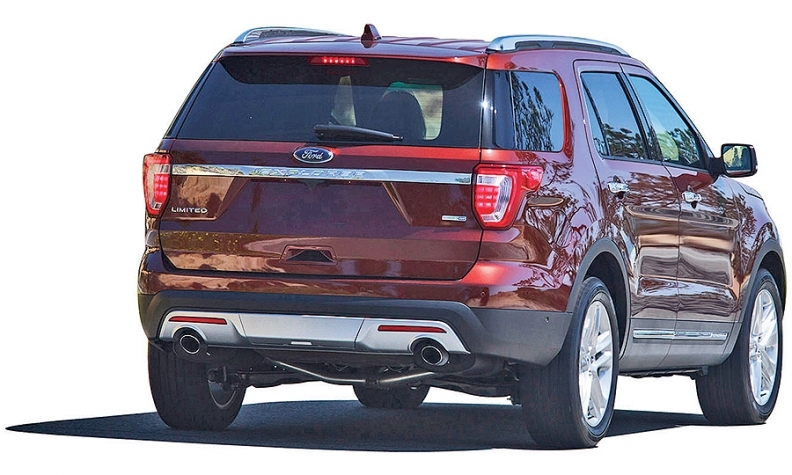 Ford said very few Explorers currently sell for more than about $47,000. "They're having lots and lots of fun at those high MSRPs," Matt Zuehlk, the Explorer's brand manager, said of GMC and Jeep. The Platinum isn't the only Explorer model to crack $50,000. At a media drive this month in the rolling hills north of San Diego, Ford provided an Explorer Sport that came within a few hundred dollars of the Platinum, thanks to options including blind-spot detection, a hands-free liftgate and second-row captain's chairs that automatically fold at the touch of a button. The Platinum and Sport come with a twin-turbocharged 3.5-liter V-6 engine and only in 4wd. The base Explorer, powered by a naturally aspirated 3.5-liter V-6, starts at $31,595, the same as the 2015 model, though it accounts for a small percentage of sales. More than half of buyers step up to the XLT, which starts at $34,295, $400 more than the 2015. For $995, buyers can get a turbocharged 2.3-liter EcoBoost four-cylinder engine, a variation of the one used in the 2015 Mustang. That replaces the 2.0-liter EcoBoost engine in the outgoing Explorer, which boosts highway fuel economy from the standard 23 mpg to a segment-best 28 mpg but had a take rate below 5 percent. The problem, Zuehlk explained, is that the 2.0 liter was only available in a front-wheel-drive configuration and wasn't powerful enough to tow. He said the new 2.3-liter engine should be more popular, despite rating 1 mpg less in city and combined driving than the 2.0 liter, because it's available in 4wd and carries a 3,000-pound tow rating. It also gains 40 hp and 40 pounds-feet of torque. Aside from adding the Platinum trim and a new engine, Ford didn't change the Explorer significantly, even though it classifies the 2016 version as a new generation. The front and rear have an updated look, with large fog lights added to the lower fascia, four grilles to signify the various trim levels, a more aerodynamic spoiler and new taillights. A 180-degree camera with washer is now standard on the rear and available on the front, and added sensors support self parking in parallel and perpendicular spaces when equipped with that option. Inside, second-row passengers gain 1.5 inches of knee room and have access to two fast-charging USB ports on some trims. The Explorer maintains the boxy-yet-modern appearance that it adopted for the 2011 model year, when Ford transformed it from a traditional body-on-frame SUV to unibody construction for a more carlike ride and improved fuel economy. Since that redesign, customers have rated exterior styling as their top reason for buying it, Zuehlk said. "Customers buy that styling because it communicates adventure," he said. "It adds that SUV-ness." The Explorer was once king of the SUVs, with U.S. sales topping 400,000 annually from 1998 through 2002, before high gasoline prices and the recession combined to end its reign. In 2009, Ford sold just 52,190 Explorers. But it's had new life as a rugged crossover, with sales climbing to 209,994 last year, including police vehicles. They've risen 20 percent in 2015 through April, nearly double the 11 percent increase for light trucks overall.